This 5-day Course is specifically designed for therapists working with adult stroke patients. As a prerequisite to attending this course, participants must have completed a Neuro-Dynamic Therapy Certification course or a NEURO-IFRAH® certification course. This course consists for lecture and intensive lab sessions. Lab sessions will focus on development of advanced patients handling skills through working with other participants and actual patient treatment by participants. 2. Discuss biomechanics of the upper extremity with an semphasis on the hand. 3. Analyze typical patterns of the hand that interfere with function. 4. Discuss the development and effect of hand function as related to proximal control. 5. Demonstrate appropriate treatment strategies during treatment practicum. 6. Synthesize information to develop appropriate treatment estrategies for persons with neurological dysfunction. 7. 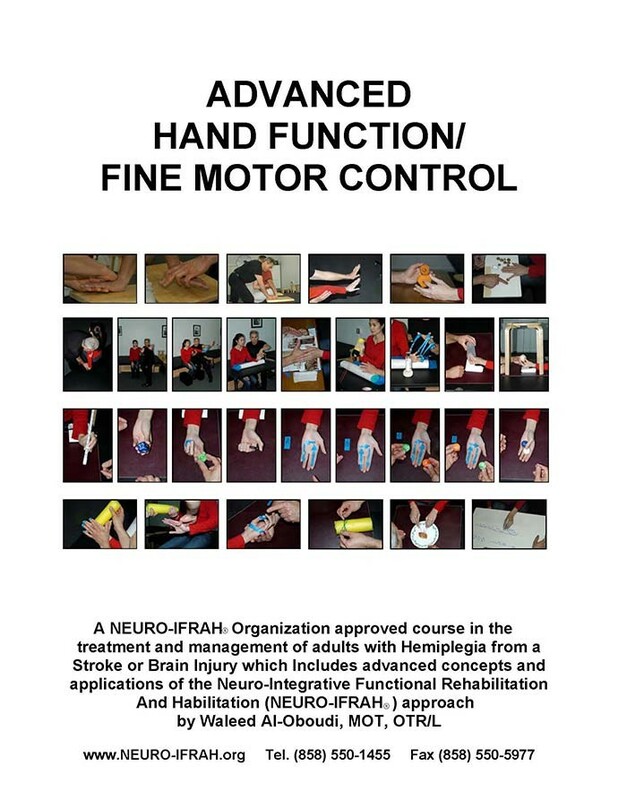 Identify concepts related to characteristics of hand use/ function, facilitation of hand function/fine motor skills, improving hand alignment and decreasing or preventing hand impairments and functional limitations. 8. Apply handling techniques to facilitate hand function in coordination with the whole body. 9. Apply handling techniques to improve hand alignment and mobility and facilitate hand function/ fine motor control in coordination with the whole body in functional conditions. 10. Identify concepts related to the restoration of upper extremity automaticity and carryover in functional use during ADL’s and other functional activities. Please note that the criteria to be admitted into Neuro-IFRAH® advance courses REQUIRE that the applicants be Neuro-IFRAH Certified® and are using the information learned in the Neuro-IFRAH® Certification Course in the treatment and management of Stroke and Brain Injury patients.